Recognizes a cell surface protein of 220-240 kDa, identified as L1 cell adhesion molecule. Recognizes a cell surface protein of 220-240 kDa, identified as L1 cell adhesion molecule. The L1CAM gene, which is located in Xq28, is involved in three distinct conditions: 1) HSAS (hydrocephalus-stenosis of the aqueduct of Sylvius); 2) MASA (mental retardation, aphasia, shuffling gait, and adducted thumbs); and 3) SPG1 (spastic paraplegia). The L1, neural cell adhesion molecule (L1CAM) also plays an important role in axon growth, fasciculation, and neural migration as well as in mediating neuronal differentiation. Expression of L1 protein is restricted to tissues arising from neuroectoderm. This MAb is useful in the identification of primitive neuroectodermal tumors. It binds to tumors of neuroectodermal and glial origin e.g. neuroblastoma and Schwannomas. It does not bind to pediatric or adult brain. 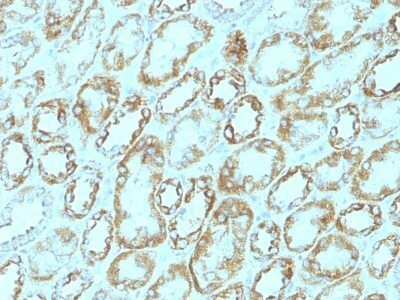 Catalog number key for antibody number 0679, Anti-CD171 (UJ127) The prefix indicates conjugation, followed by the antibody number and size suffix.